Ivory Coast is one of the most megadiverse countries of Western-Africa. Nevertheless, entomological diversity, including ants, remains poorly known. Recent surveys by Dr. Yeo Kolo hosted at Lamto ecological station and other sites in Ivory Coast (Yeo, 2006; Yeo et al., 2011), indicated that its entomological and especially its ant fauna is extremely rich, unique and taxonomically important but also that it is sensitive to global changes such as deforestation, climate modification and probably also introduction of invasive species. Besides general attention for soil-dwelling entomofauna groups, the main focus of this training will be on ants. Ants are one of the most informative and tractable groups for biodiversity evaluation and monitoring because they are ecologically and numerically important, sensitive to environmental changes and easy to collect in a standardised way. Unfortunately, in Ivory Coast, ants are only recently studied (Kone et al., 2012). These recent studies indicate a very diverse fauna which has important implications on other soil-dwelling entomofauna groups. to develop reference collection, using the best modern sampling and curation techniques. To attain this objective, students were supervised by an international team of three experts in entomology (with focus on myrmecology) and collection curation during ten days. The course combined classroom lectures, laboratory and fieldwork experiences. This high-quality training has stimulated local students and future scientists to carry out research on entomology and myrmecology, especially within the framework of conservation projects. 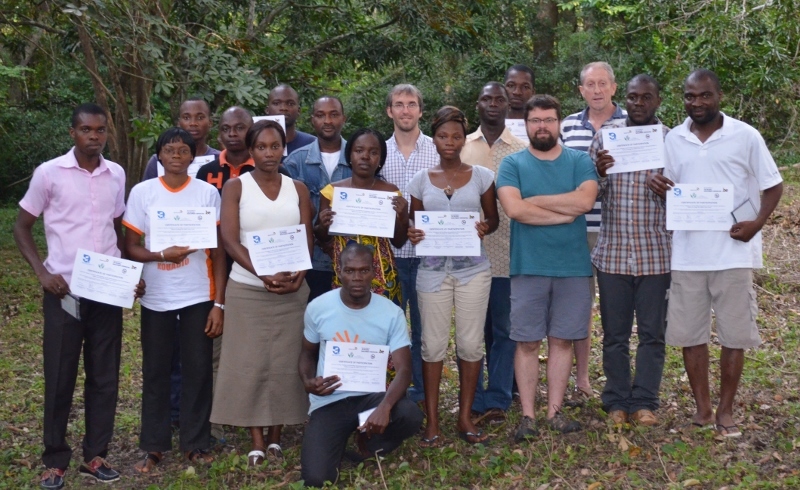 Photo: Students and professors having taken part in the ant training. Students show the certificate they obtained at the end of the training.